These words were Erin Gilbert's mantra for many years. From her high school days to the end of her undergraduate work, Erin maintained her zeal for exploring the paranormal. And now, with the Ghostbusters, that zeal has been rekindled! Erin Gilbert, Ph.D., M.S., previously taught theoretical physics at Columbia University before taking permanent extended leave to co-found the Ghostbusters. Erin has been friends - and, for a short time, frenemies - with Abby for nearly three decades. As a wise man once said, "There is no spirit more powerful than the spirit of friendship." Kristen Wiig played Erin, and unlike a lot of Mattel movie toys, you might actually be able to guess that just based on her toy! The likeness isn't great, leaning a little more toward "cartoony" than "realistic," but that can work sometimes. Still, you want it to be an intentional choice, not just a result of shoddy workmanship. 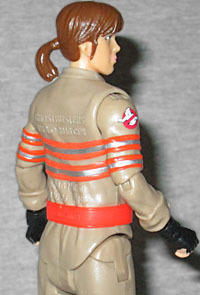 Instead of using one generic body for all four 'busters, as they did for the men, Mattel has created unique molds for each woman. Erin's jumpsuit is very wrinkly, like she keeps it rolled up in a ball when she's not wearing it. The reflective safety stripes are raised elements, and she has her sleeves rolled up, meaning we can see a bit of arm above her black gloves. The chest flap folds over a little, and her name is tampographed above the breast pocket. Actually, speaking of pockets, it's clear that the movie used two different styles of jumpsuit: Abby's had pockets on the front of the thighs, while Erin's doesn't. The articulation is minorly disappointing. I know that seems like a given when we're talking about a Mattel release, but this is even more than usual. See, when the boys were turned into action figures, they had balljointed heads and swivel/hinge wrists, adding just a tiny bit of posing variety. Erin (like all the girls) only has swivels in both those spots, meaning she's already at a disadvantage. The rest of the joints are the same - shoulders, elbows, waist, hips, thighs, knees and ankles - but those small changes are nonetheless disappointing. 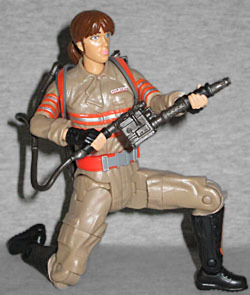 The figure only comes with one accessory, but it's the one you'd want: her proton pack. The sculpt is completely accurate to the new design seen in the film, but it's barely painted at all; if you really want the toy to look right, you'll need to put in a lot of customization work. 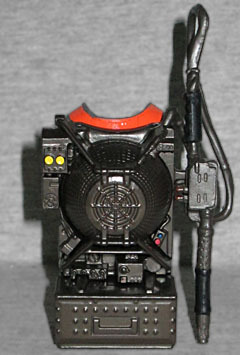 There are no pegs or anything - the proton pack is just held in place on the figure by the straps over the shoulders. If you want to get nitpicky, the orange belt the figure is wearing is part of the proton pack, not the uniform, but it still looks okay the way it is. Shame she couldn't come with a Swiss Army knife, though. 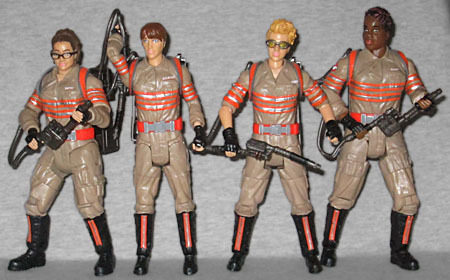 The Ghostbusters figures each come with a Build-A-Figure piece (which Mattel is still calling "Collect and Connect," because they're Mattel and they have to do every dang thing in the worst way possible). The BAF is Rowan, and Erin has his legs. Erin Gilbert. Particle physicist, academic firebrand, spectral warrior. And also one of the most plentiful figures. The Ghostbusters toys have started to go on clearance, and everywhere you go, Erin and Abby are the two who are easiest to find. Maybe it's the lingering taint of Gilly that's keeping everyone away.